I was ready to write about this 10 days ago, but the data wasn't out yet. And then life got in the way, as it always does. On the bright side, Wipneus has just updated his PIOMAS graphs to mid-October. More on that below, but first I'll discuss the minimum. Whether the 2018/2019 freezing season can follow in the footsteps of 2016/2017, or whether it will move towards 2017/2018, is difficult to tell right now. But I wouldn't be surprised if this winter follows the recent trend of warm winters resulting in low maximums. Latest JAXA SIE data is in, lowest on record as of yesterday. This is a weather related phenomena. What are the specific weather related conditions that are causing this particular ice condition? It is clear that arctic sea ice is in a long term decline due to climate forcing caused by increased CO2 and AGW. This particular decline, while part of the general climate pattern, is better described as part of the variability caused by weather for a particular year. The Daily Arctic Temperature graph displayed above showed much higher than normal temperatures for January through March and still ice survived in September of 2018. While tracking current conditions are important, please disclose what the historical observed correlation of October ice conditions are compared to the subsequent September minimum. Please present facts, not guesses or "I wouldn't be surprised" statements. "By using a simple and computationally inexpensive statistical approach, one can anticipate more than 80% of SSIE up to 4 months in advance, based on the antecedent atmospheric and oceanic conditions over stable regions." A method that can only predict 80% of actual coverage 4 months in advance does not appear to be a particularly useful method, but perhaps others will not see it that way. "atmospheric variability provides an inherent limit on sea ice predictability. For example, while 2013 started out with a large fraction of thin, first-year ice following the record minimum of 2012, comparatively benign summer weather conditions enabled a large fraction of that thin ice to survive, which was not foreseen by the forecasting community. Thus, while we expect sea ice extent to continue to decline in response to forcing from atmospheric greenhouse gases, interannual departures from this long-term trend will remain hard to predict." There's a remarkable lack of thick ice in the Wandel Sea off north east Greenland this Autumn. P.S. I upgraded WordPress over at GWC today. Everything looks fine in my usual browser, Opera. In others the images aren't displaying properly. Sorting that out will have to wait until tomorrow (UTC). Just click the little thumbnail if you want to see the informative images. You want me to present facts about the future? Okay. Of course, but not from AGW. What I was looking for was a measure of whether October ice conditions have any predictive significance with respect to the following year September minimum. Your statement was a rather unscientific guess - how about some data about correlations based on prior year observations and whether October conditions have any correlation to the following September minimum. Can you present facts to corroborate your statement? Anybody can guess. Of course not. It is neither short-term nor long-term enough. Have you just started looking into Arctic sea ice loss? It wasn't a guess at all. I'm not guessing anything. I'm saying I wouldn't be surprised if the same thing happens that we've seen the past couple of winters (relatively warm, low extent, low volume). I wouldn't be surprised if it doesn't either. I simply don't know. Isn't that the most scientific thing one can say? how about some data about correlations based on prior year observations and whether October conditions have any correlation to the following September minimum. There is not enough data. Ask again in 20-30 years. Are you done trolling now? I have been here many years and even kicked money into the pot at one point. I value the site for its science and observations. I have been a critic of simple line drawing projections of future Arctic Sea Ice and projections of a faster disappearance of ice at the September minimum, and premature claims concerning when the arctic will have ice free summers. My criticism has been born out by actual conditions and observations. Any time current ice conditions are low there are comments about this being the year of a new minimum. How accurate are such projections? Based on your comments, it appears that there is no correlation and such comments are not valid. Just go back and look at comments I made in 2011 that predicted that the arctic would not be ice free in the time frame indicated by Wipnius's line projections and others, including Wieslaw Maslowski. There appears to be a database going back to 1979. That is 39 years so I do not understand your contention that there are not sufficient data points to prepare a correlation analysis and that 59-69 years of data are required. Waiting 20-30 years will be too late as there will be many periods far below the minimal standard used by many commentators as to what constitutes "ice free" conditions at the September minimum over the next 30 years. I provided a link to research by Mark C. Serreze and Julienne Stroeve. Are they not considered reputable researchers on Arctic Sea Ice? Serreze is the Director of the NSIDC. Julienne Stroeve is a Senior Research Scientist at NSIDC. I was hoping you had information on the correlation of current ice conditions to the next September minimum as opposed to a statement concerning your lack of surprise as to what future conditions might be regardless of what those conditions might be. If you do not have the information just say so. Which of the current models do you endorse, if any, as having the most accurate projection of future arctic sea ice? @Neven - Logging in via Facebook is still broken. What's the problem with that? sound an awful lot like "trolling" in Neven's book, and in my alter ego "Snow White's" for that matter? Jim, would you be worried at all that the seasonal FDD-Anomaly is now officially the lowest on record? The 30 day anomaly is of course a ghastly colour but the 7 and 1 day anomalies look to have calmed down a bit. So, would you be worried about any of this at this point or could this all turn back to normal lickety-split? I can comment again at long last, after a not so brief hiatus. Logged in using Typepad credentials on this occasion. comment box appeared for me too. Please excuse the delay in replying. I asked the question of Neven because I value his opinion and the various models for the projection of future arctic sea ice conditions is a moving target and changes over time. I thought Neven might be more current on the models than I am and was hoping he would identify the models in which he places the most trust. You also appear to have a great deal of knowledge on this subject. Which model or models of future arctic ice projection do you believe are the most accurate? I understand that the models can only be used for general projections and the current conditions at any one point in time reflect weather and not climate so conditions during a particular year can not be used to either validate or to invalidate a particular model. Clearly arctic ice will continue to decline as more CO2 is added to the atmosphere - it is a matter of simple physics and not a matter of opinion - what I am interested in understanding is which model people like Neven and you, who are far better versed in the science than I am, believe represents the best estimate of how quickly this decline will occur. Perhaps due to variability and the difficulty in incorporating all the factors impacting arctic ice there are no models that can be relied upon, but I am interested in your view of the current models strength and weaknesses. I'm not that well-versed in science or models. A comprehensive discussion of strengths and weaknesses would take a lot of research. The consensus, more or less, among cryospheric scientists researching Arctic sea ice, is that the Arctic could go ice-free for all practical purposes (ie below 1 million km2 of sea ice area/extent) somewhere in the 2030s. I maintain it could happen before that, but it would take extraordinary conditions for it to happen the first time. The last couple of melting seasons were preceded by such extraordinary conditions, especially 2017, but conditions during summer were rather ordinary. Maybe the two are correlated, and so that's one of the things I'm keeping an eye on. Hence that final paragraph. But let's return to the thing that caused all these questions. I never replied to your Oct 22 comment, because I was busy preparing for travel. I haven't done any of that in this blog post. First of all, I was talking about the next maximum, not the minimum. And I didn't say it because of conditions at the time, because conditions have changed drastically, and I still hold the same opinion. I have better things to do than pat you on the back for your WAGs. I was hoping you had information. If you do not have the information just say so. I have no duty or responsibility whatsoever to fulfill your hopes, especially if you take my statements out of context. 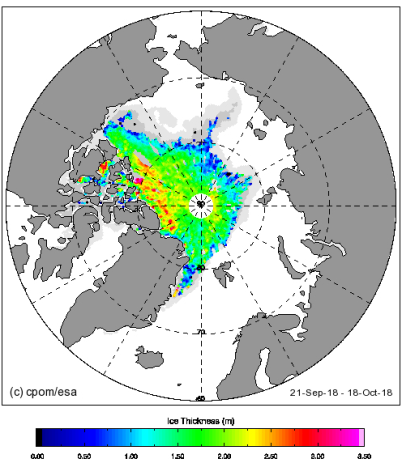 If you feel like you want to discuss more than actual conditions, or something that is not the subject of the blog post you comment on, I can recommend the Arctic Sea Ice Forum.